At the invitation of Premier Li Keqiang of the State Council, Prime Minister of the Republic of Kazakhstan Bakhytzhan Abdiruly Sagintayev will pay an official visit to China on November 21 to 22, during which Premier Li Keqiang will co-host the 4th China-Kazakhstan Regular Prime Ministers' Meeting with Prime Minister Sagintayev. The mechanism of China-Kazakhstan Regular Prime Ministers' Meeting is an important platform for the two sides to coordinate the planning and advancement of practical cooperation. It is of great importance for the two sides to implement the consensus of the two heads of state, deepen mutually beneficial cooperation in various fields, and push forward China-Kazakhstan Comprehensive Strategic Partnership. Under the strategic guidance and personal efforts of President Xi Jinping and President Nazarbayev, China-Kazakhstan Comprehensive Strategic Partnership has been operating at a high level in recent years. The two sides have seen frequent high-level exchanges, stronger political mutual trust, fruitful outcomes of the Belt and Road Initiative and the industrial capacity cooperation, and closer coordination on international and regional affairs. This will be Prime Minister Sagintayev's first visit to China after assuming office. President Xi Jinping will meet with him. Premier Li Keqiang will co-host the 4th China-Kazakhstan Regular Prime Ministers' Meeting with him. Under the witness of the two Prime Ministers, relevant departments on the two sides will ink a series of cooperation agreements. 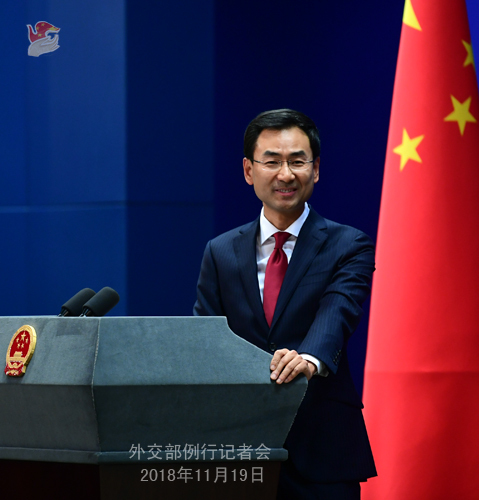 China hopes that this visit will contribute to consolidating mutual trust between China and Kazakhstan, strengthening synergy between the development strategies of the two sides, deepening all-around cooperation under the framework of the Belt and Road Initiative, and further substantiating the China-Kazakhstan Comprehensive Strategic Partnership. Q: The 26th Asia-Pacific Economic Cooperation (APEC) Economic Leaders' Meeting was just concluded. How does China view this meeting? Considering the complex international situation at this moment, how does China think of the role of APEC? A: The 26th APEC Economic Leaders' Meeting was held as the world economy and the Asia-Pacific economy are faced with both opportunities and challenges. With the concerted efforts of all parties, in particular under the positive arrangements of the host Papua New Guinea, the meeting has promoted practical cooperation across the board under the APEC framework and achieved positive outcomes. China has always been an active champion and devoted practitioner of the Asia-Pacific cooperation. President Xi Jinping delivered an important speech at this meeting, in which he made important propositions on such issues as building an open economy in the Asia-Pacific, fostering new growth drivers, improving the connectivity network and forging a closer partnership. He also expressed his opinion about a post-2020 vision for APEC, and called on parties to stay committed to the purpose of advancing regional economic integration when drawing up a blueprint for post-2020 APEC cooperation. Leaders attending the meeting actively echoed President Xi's vision for cooperation, appreciated China's important role in the Asia-Pacific cooperation and looked forward to stepping up cooperation with China to jointly promote development and prosperity in the Asia-Pacific. Since its inception, APEC has made positive contributions to advancing trade and investment liberalization and facilitation in this region and promoting regional economic integration. It has always been in the vanguard of building an open world economy. Today's Asia-Pacific has the world's most dynamic and promising economic plate, which is recognized as a key engine driving world economic growth. China stands ready to work with various parties through APEC and other relevant mechanisms to enhance partnership, strengthen coordination and cooperation, and make greater contributions to the development and prosperity of the Asia-Pacific. Q: First, the 26th APEC Economic Leaders' Meeting failed to issue a leaders' communique at the end of the meeting. The US officials said that it was China's objection that led to the failure in reaching consensus. What is your comment? Second, reports say that Chinese delegates allegedly tried to barge into the office of the Papua New Guinea's Foreign Minister and even the police were called to the scene. Can you confirm that and comment on it? A: Do you believe this story? Polite and well-behaved Chinese diplomats barging into the office of the Papua New Guinea's Foreign Minister? I will take this question first. As the host, Papua New Guinea has made well-thought and meticulous efforts for the organization and arrangement of the APEC meeting. China commends that. In fact, China has been in smooth and effective communication with Papua New Guinea. The so-called barging into the PNG Foreign Minister's office is purely a rumor from someone with ulterior motives. The PNG has made clarifications on that. Any plot to undermine China-Papua New Guinea relations will not succeed. Back to your first question, the APEC meeting indeed failed to adopt the final communique. But the reason for that is not the one given by the US side. During the 26th APEC Economic Leaders' Meeting, all participating parties exchanged in-depth views on Asia Pacific cooperation and reached important agreements. The meeting advanced all-around practical cooperation under the APEC framework and achieved positive outcomes. China sends its congratulations to the success of the meeting and commends the positive role played by PNG as the host. During the meeting, the trade issue, which is the concern of all parties, was discussed, with focus on the multilateral trading system. The majority of members voiced their support for multilateralism, multilateral trading system and the due role of the WTO. Many members, in particular developing members, made clear their position on opposing trade protectionism and upholding the development interests and space of developing countries. They have chosen to stand on the right side of history. On the issue of strengthening and improving the WTO, China believes that the WTO needs to be kept abreast of times and supports making necessary reforms to the WTO, but such reforms must maintain the core values and basic principles of the WTO. The relevant process is yet to be launched. Parties still have divergent views on the relevant issues. More in-depth discussions are needed to narrow down differences and expand consensus. Considering all these factors, we believe that what needs to be avoided is to rush into prejudgments, and even less to practice protectionism under the name of reform which only harms other countries' fundamental interests by imposing one's will on others. As far as I know, such act of power politics and economic bullying was met with opposition from the majority of members. Decision by consensus is a basic principle all members abide by when participating in the APEC cooperation. It is also a prerequisite for the sound development of APEC. All parties shall respect each other, seek common grounds while shelving differences, and promote practical cooperation and common prosperity on the basis of consensus building. China is committed to pursuing development through opening-up, building an open world economy, promoting regional economic integration, and upholding multilateralism and the multilateral trading system. We have fulfilled our due role and made important contributions to the global and regional economy through concrete actions. China has been supporting Papua New Guinea in hosting a successful APEC meeting from the very start and has played a constructive role in ensuring positive outcomes. We have demonstrated utmost sincerity. China will continue to strengthen communication with all parties to promote the APEC cooperation and participate in the discussions of relevant issues. Q: On the sidelines of the APEC meeting, Tonga signed an agreement with China on the Belt and Road cooperation. At the same time, the Tongan government officials said that China has agreed to defer some of Tonga's debt. Can you give details on this discussion about Tonga's debt and how long is China willing to defer this debt? A: During President Xi Jinping's meeting with the leaders of the Pacific island countries having diplomatic relations with China last week, they reached extensive agreements on strengthening cooperation in the fields of trade and investment, infrastructure building, and transportation and communications under the Belt and Road framework. As for the specific issue you asked, I have no information to offer. Q: US Vice President Pence reportedly said in his address at the APEC CEO Summit that the US will offer support to the infrastructure development of the Indo-Pacific region and pledges to offer a 60 billion US dollars' worth of infrastructure funding which does not involve a constricting "belt" and a one-way "road". Reports say that this is veiled criticism against China. What is your comment? A: We have noted these remarks by the US side. We will not try to find any correlation. But since the US side mentioned "belt" and "road", then I have to say a few points about ours. First, the Belt and Road Initiative proposed by China is for economic cooperation and meant to offer public goods to the international community. It operates in accordance with commercial and market principles based on mutual respect and win-win cooperation. If it had any constricting terms, it could not have seen so many cooperation projects up and running. If it was "one-way", then we could not have seen more than 140 countries and international organizations signing onto the Belt and Road cooperation agreements. Second, the international community generally welcomes and supports the Belt and Road Initiative. I can give you two latest examples out of the so many. The Chinese side just met with the leaders of the Pacific island countries having diplomatic relations with China. During the meeting, they all expressed their wish to expand practical cooperation with China under the Belt and Road framework to boost their own economic and social development. Philippine Finance Secretary Carlos Dominguez III also said in an interview yesterday that the Belt and Road Initiative is a transparent one for win-win results, and the Philippine side has chosen to join it on a voluntary basis. Third, the US side claimed that it supports regional infrastructure building and would like to offer a 60 billion US dollars' worth of infrastructure funding. Such a pledge by the US side, out of what purpose notwithstanding, will help the development of regional countries. It's good news and China welcomes that. Meanwhile, we take note that some voices that the US is just paying lip service and will never walk the walk. We hope that their worry will not be proven to be reality. I believe that the public will be the best judge of that. The international community cares and will watch if and how the US fulfills its promises. Q: President Xi Jinping met on Saturday with President Moon of the ROK in Papua New Guinea. The ROK Presidential Office quoted President Xi as saying that he will probably visit the DPRK next year. Can you confirm that? A: We have released relevant information on President Xi Jinping's meeting with ROK President Moon Jae-in. You may refer to our press release. As for visiting the DPRK as you asked, I have no information to offer at the moment. Q: Regarding the APEC meeting in Papua New Guinea, basically it seems to boil down to the United States saying that they are in favor of free trade and the WTO working better to reform its practices. And on the other side, China is objecting to the language that the United Sates says it supports in the draft communique. So, neither the US nor China would give way. What does that mean about the relationship of these two big countries? Do they vie for the leadership in the Asia-Pacific region? A: As to why the APEC Economic Leaders' Meeting this year failed to issue a leaders' communique as usual, I just replied to that question and won't repeat my answer. Regarding the relations between China and the US in the Asia-Pacific, we have noted that there is indeed a lot of attention on the interactions between China and the US at the APEC meeting. Someone mentioned that China and the US look like two giants sitting in the room. I would like to say that it is natural for China and the US to attract some attention at the APEC meeting, because China is the biggest developing country with an economy ranking No.2 worldwide while the US is the biggest developed country and the world's top one economy. But APEC members are all equal and should conduct cooperation on the basis of mutual respect and make decisions upon consensus. China attended this APEC meeting with utmost sincerity. In his important address at the meeting, President Xi Jinping stated China's position and proposition on how to promote world economic development and enhance global economic governance, and offered proposals on how to deepen cooperation in the Asia-Pacific. Our remarks targeted and challenged no one. But I believe you all know how the US behaved at this meeting. It seemed like the US attended this APEC meeting with great anger. Its speeches and remarks at the meeting openly caused controversy, created discord, spoiled the atmosphere of the meeting and did not contribute to achieving consensus and carrying out cooperation. We have been saying that the Pacific Ocean is vast enough to host both China and the US, as well as other countries in the Asia-Pacific. The Asia-Pacific is our homeland where countries live and prosper side by side, not a battlefield where one's loss is another's gain. APEC is a platform for deepening cooperation, not for pointing fingers at each other. China took part in this meeting to seek consensus and cooperation, not to get into a boxing ring or spat with anyone. We hope that the US will work with China and other parties, respect the reality of diversity in the Asia-Pacific, advance APEC cooperation, build a big family for the Asia-Pacific countries, and promote the regional economic integration process on the basis of mutual respect, mutual benefit and win-win results. By the way, anger can take a toll on the body and is bad for the health. Whoever gets angry easily will only end up hurting himself. Follow-up: Who has the anger? Q: The Cambodian Prime Minister recently said that he received a letter from US Vice President Mike Pence who voiced concerns about reports on China's plan to open a military base there. I wonder if you could comment on that? A: China and Cambodia are friendly neighbors. Cooperation between our two sides is open and transparent which targets no third party and gives no ground for criticism. We hope the relevant side could view it in a correct way. Q: Australia and the United States announced that they would revive the military base in Manus Island which is actually territory of Papua New Guinea. Australia and the US have to get permission from Papua New Guinea to do this. Since China is such a good friend of Papua New Guinea, especially after APEC, will China do its best to persuade Papua New Guinea that a new military base in Papua New Guinea built by Australia and the United States is not a good idea? A: We don't have that dark side as you suspected. China adopts an open attitude to regional countries developing normal relations and cooperation. We hope that relevant exchanges and cooperation will accord with the aspiration of regional countries for common security and common development and contribute to preserving and promoting regional peace, stability, development and prosperity. Q: The South China Morning Post reported that Vice Premier Liu He would head an economic team to Argentina instead of Washington for trade talks with the US. What's your comment on this? 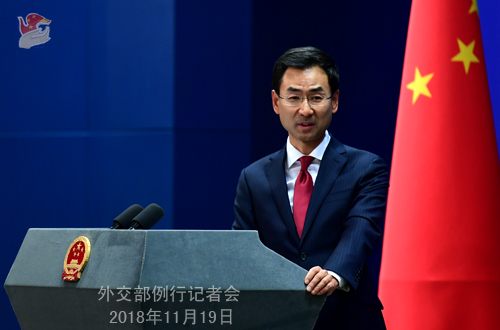 A: After the heads of state of China and the US spoke on the phone on November 1, the two sides have resumed high-level contacts in the economic and trade filed. In the meantime, the economic teams of the two sides are in close communication to earnestly implement the agreements reached during the telephone conversation between the two heads of state. Regarding the specific question you asked about, I would like to refer you to the competent authority. 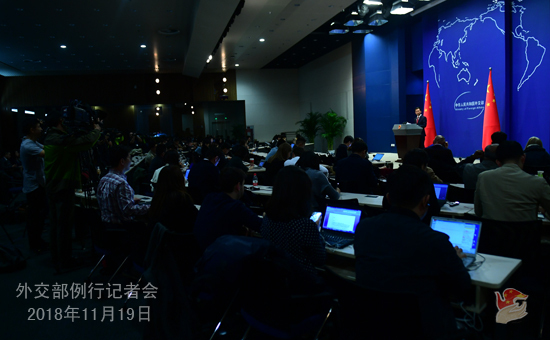 As for the relevant information and arrangement of China's attendance at the G20 summit in Argentina, we will release relevant information in due course.